If you’re wondering what materials to choose for your bathroom countertops and vanities you may be feeling overwhelmed by the range of choices out there. Not only are they a necessity for your bathroom sink and a handy storage space for your toiletries, but they’re an important aesthetic element of your bathroom. As such they need to be considered carefully before you pick a countertop or vanity unit based on colour or price alone. Here is a quick overview of some of the most common materials you can choose for your bathroom countertops and vanities. On the more expensive end of the scale, you’ve got granite and marble. Both incredibly heavy, so if using these for bathroom countertops, make sure the units supporting them can withstand their weight. The last thing you want is a sagging unit a few years down the line. Marble can be prone to staining as it is a porous material, (more porous than granite) so a marble sealer is recommended if choosing marble countertops or vanities for your bathroom. This should ideally be reapplied every few years as well to keep it effective. Often seen as countertops in new builds these days, quartz and stone make an ideal bathroom countertop. You get the look and feel of marble or granite but without the maintenance and even heftier price tag that marble has. With an almost endless choice of colours, grains, styles and finishes, you really can get the look and feel you want with a stone bathroom countertop. While not particularly common, you could opt for a tiled benchtop. The drawback of this is the maintenance to keep your tiles and grout looking clean and fresh. Also if a tile chips it may be difficult to repair or replace. 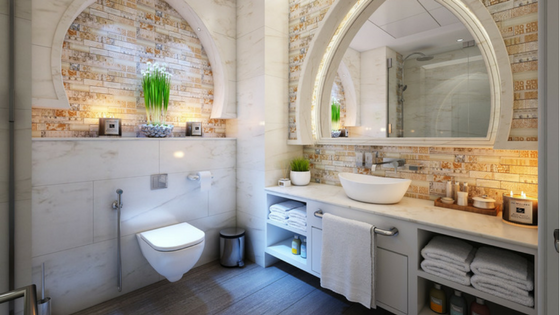 However, it can give your bathroom a really unique style and make a stand out feature of your vanity unit. You might not think that wood is a great choice for bathroom countertops and vanities, but if properly protected they can give your bathroom a warm and earthy feel. If you want to think environmentally, reclaimed wood can be turned into a gorgeous countertop or unit, saving you money, and it’s eco-friendly too. Make sure any natural wood in your bathroom has been fully protected from water damage and other potential stains (like toothpaste and creams). A varnish or oil designed specifically for wood will do the trick. You can also consider adding a layer of glass over the wooden countertop to give it that additional layer of protection without losing the natural look. When it comes to bathroom vanities, you need something that is strong, can withstand damp conditions and will last for years without warping. That’s why a lot of people opt for HMR (High Moisture Resistance) board. It’s a kind of particleboard which has an extra resin on it, making it super moisture resistant. This means it’s also less likely to fall prey to mould and other bacterial growth, which can often occur in damp areas like bathrooms. If you’re struggling to choose the right materials for your bathroom renovation in Perth, chat to our plumbers in Perth today. We’re specialists in bathroom, laundry and kitchen renovations in Perth and have helped dozens of home owners create their perfect bathrooms, kitchens and laundries. Call us on 0451 781 384 or contact us online and we’ll get back to you as soon as possible.